Mid-winter, and in most cases, the coldest month of the year. The Canary Islands are of course still quite mild and coastal areas of mainland Spain are not doing too badly but there is a cold band inland across the north of the country which is colder than London, with Soria only averaging 2.0oC. The highest temperatures for mainland Spain are along the coast of Andalucia, the Costa de la Luz, Costa del Sol and Costa de Almeria. Surprisingly, La Coruna, in the Region of Galicia, on the north west tip of Spain, is significantly warmer than Barcelona and the Costa Brava due to the warming effect of the Gulf Stream passing by. The days are lengthening and in most cases the average temperatures are already rising, particularly in inland areas, which have generally risen by 1-2 deg. On the coast however, temperatures have already been held a little higher by the warming effect of the sea (which is not itself warming yet) and so little change is seen compared to January. The figures for San Sebastian are in fact lower than for the previous month, while Tenerife stays the same. A significant increase in day length and the sun is getting higher in the sky. Inland areas are showing around 3 deg increase in average temperatures, and the south coast of the mainland showing similar increases, where clearer skies are letting more sun through. Barcelona is catching up with La Coruna this month. The continental affect sees central areas still rising quicker than coastal areas, with Madrid almost the same as La Coruna (having been nearly 5 degrees colder in January). The cold band across inland northern Spain is still similar to London. May sees temperatures rising by around 3 degrees on the south coast of Spain and around 4 degrees in central areas. Temperatures on the north coast are now being held back by the cooling effect of the Atlantic Ocean, rising just over 2 degrees on the previous month, with Madrid now significantly warmer than La Coruna. Meanwhile, Tenerife, on the Canary Isles, has risen less than 3 degrees from the very mild figure for January. A pleasant month, when day length reaches it's maximum and the sun is high in the sky, most parts record average temperatures above 20oC. The Gualquivir valley, which runs across northern Andalucia via Cordoba and Sevilla, is now showing higher temperatures than the south coast, not benefitting from the cooling effects the latter gains from the sea. The hottest month for many inland areas, while coastal areas are still being cooled by the sea. Madrid is now 19.3 degrees hotter than it was in January while Ciudad Real is 20.1 degrees hotter. Meanwhile, Almeria is only 13.2 degrees hotter and Tenerife only has average temperatures 6.7 degrees higher than in January. The days are already getting shorter and the sun not so high in the sky. Inland areas start to show slightly lower average temperatures than the coast, which is receiving less of a cooling effect from the sea, which is still getting warmer. Temperatures are starting to fall now, though this is much more noticeable in inland areas than on the coast. 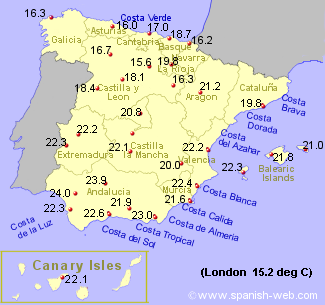 In particular, the Canary Isles and the Costa Verde north coast of mainland Spain only show a very slight fall in average temperatures, being helped the warm sea temperatures. Into autumn with day length decreasing rapidly and the sun lower in the sky, average daily temperatures are falling by 4-5 degrees everywhere except the Canary Islands where they are only falling by 1.5 degrees. Rain is also becoming more of a possibility although there is still a very large variation according to location. Higher ground inland on mainland Spain may now be colder than London while the south coast remains 10 degrees higher and the Canary Isles 14 degrees higher. Snow may start to fall on the very highest ground. As temperatures fall further, coastal areas are still getting some benefit from the sea which is likely to be above air temperature, while the southern mainland coast stills receives high levels of sunshine making daytime quite pleasant.